Paul Oakenfold, Armin van Buuren and Paul van Dyk have joined forces to pay an homage to the victims and visitors of the 19th edition of the Loveparade. All proceeds of ‘Remember Love’ will be donated to charity. On July 24th 2010, more than 500 people were injured and 21 people were killed after panic broken out due to overcrowding in the tunnel entrance of the Loveparade festival terrain. A tragedy, not only for those involved, but for the entire dance scene. To help support the victims family members, persons injured and remember the spirit of the famed dance event, three world-famous DJ’s have now united. 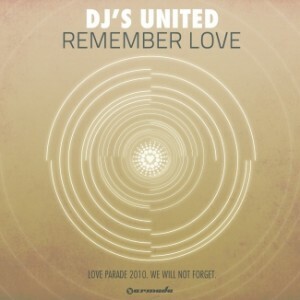 UK, The Netherlands and Germany are represented by Paul Oakenfold, Armin van Buuren and Paul van Dyk, coming together on powerful trance anthem ‘Remember Love’. All proceeds of ‘Remember Love’ will be donated to the Association of Non-statutory Welfare in North Rhine-Westphalia Germany, which started an appeal to support the victims family-members and persons injured.